“At a bar called O’Malley’s, where we´ll plan our escape.” You probably recognize this lyric from the Rupert Holmes song, “Escape (The Pina Colada Song)”, an ode to discovery, or infidelity, or to an escape from a monotonous relationship. Whatever the song means to you, it reveals a lot about relationships in changing times. An interesting piece of trivia: Escape was the last #1 song of 1979 (and thus the 70’s decade), was bumped from #1 for one week, and then went to #1 the second week of 1980. It is the only pop song to climb to #1 in two different decades. 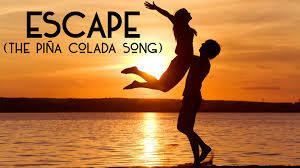 The basic premise of “Escape” was that the singer was tired of the same old thing with his old lady. “Like a worn-out recording, of a favorite song”, he felt it was time to move on so he was scanning the personal ads. I guess there are still personal ads in papers, but the online world has pretty much changed the method of communication to tweets, Instagrams, Flickr, Tinder, Facebook (for us older folks) and so on. People plan their escape now over the Internet, often to the surprise of their family, friends and lover. As the singer scans the personal ads, he sees one that catches his eye, where the writer posted: “If you like Pina Coladas, and getting caught in the rain; If you´re not into yoga, if you have half a brain; If you like making love at midnight, in the dunes of the cape; I´m the love that you´ve looked for, write to me, and escape.” That brings back a sparkle in his eye apparently, probably because that is what he and his old lady used to do. Their fire for each other having diminished, he seeks to rekindle that flame, inside him at least. So he writes his own post and suggests that they cut through the red tape and meet tomorrow at O’Malleys. When that fateful time comes, he recognizes her in an instant. It was his own lovely lady, and there and then they rekindled their romance. It’s a pleasant sounding song about infidelity of the heart, but fate intervenes and all ends up well. However, that is not usually the way it ends up these days. There is an astonishing variety of “investigative search” websites that let you track almost anyone, for a fee. Using access to public information, these sites can tell you a lot about your partner, or prospective partner. For instance, does your partner have an Ashley Madison account? Ashley Madison promotes adultery for fun and yes, lots of folks got caught up in that mess last year. As a result of a major hacking incident, millions of Ashley Madison account holders were “outed”, including some notable figures in Middle Georgia. No matter how a jilted loved one finds out about betrayal, it usually ends up in a mess of an argument, if not litigation. A wife in Las Vegas has allegedly filed a suit against one such investigative service, claiming it ruined her life by posting information about her, which her husband used to confirm his suspicions about an affair. She’s not suing because anything was false or misleading, she’s suing because the service made the information easily accessible to her previously unknowing spouse. If that seems bizarre, I agree. The “lawsuit” might be a clever attempt by this specific service to drum up business. The “wife” only sued for $700 according to the court’s docket sheet and the complaint has never been served, despite it being a year since the case was filed. Filing costs were only $66 and no attorneys are listed. I think I smell a rat. Nevertheless, we can all agree that far more information is readily available about people if one spends some time doing a web search. Even public information can, in certain circumstances, be detrimental to one’s private life. It’s enough to make you want to drink. Pina Colada anyone?